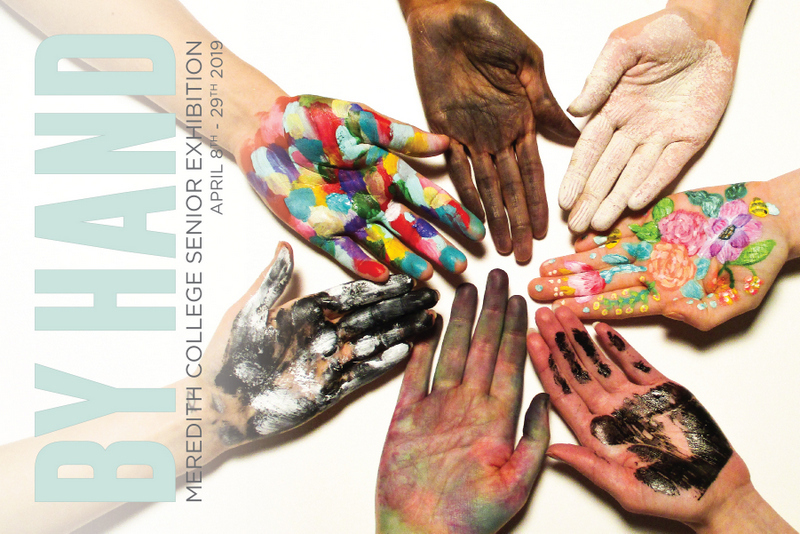 April 8-29, 2019: The Meredith College Art Department is hosting an exhibition of curated work that reflects the artistic progress of seven senior studio art majors from the class of 2019. Viewers will be offered a chance to peek inside the minds of these artists as their practices developed throughout their college journeys. By Hand is an exploration of human interaction with the tools and principles of the artistic process. The results will be diverse, but the act of learning and making is experienced differently by all artists. The exhibition will display works made by artists who have clay under their nails and paint in their veins. Each artist has chosen a series of work that reflects their own individual approach to art-making, media, and concept. The exhibition will encompass a variety of methods from all disciplines of studio art, such as ceramic sculpture, graphite and charcoal drawing, painting, printmaking, and sculpture. Shape, line, texture, and personal imagination are the driving forces of their work. Exhibiting artists will include Sarah Beatty, Tori Burke, Bryson Currier, Whitney Ross, Jessica Wallace, Nikki Wertz, and Abby Williams.